Artist Tim Klabunde is a Santa Fe based sculptor, native to Washington state, and a graduate of the University of Minnesota. Choosing a lifestyle inspired by the abstracts of his life experiences, Klabunde began his artistic career after serving in the military, and gaining experience with the engineering and the welding of steel. 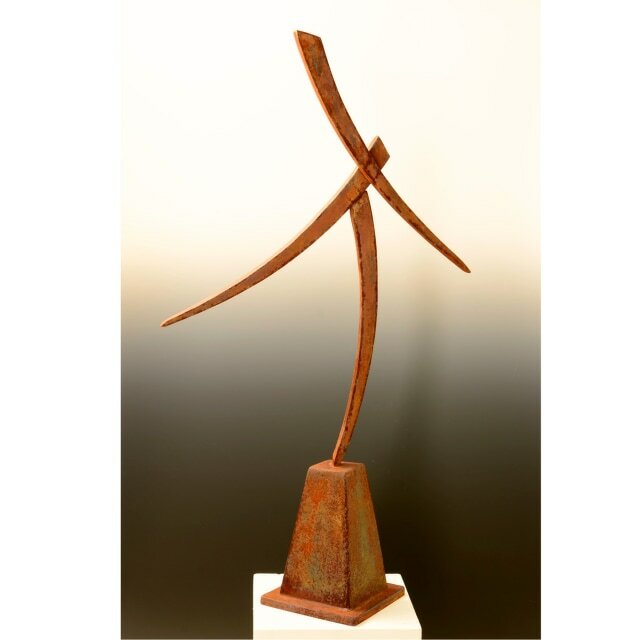 Since an award-winning experience in 1981 at the Santa Fe Festival of the Arts, Klabunde has decided to build his lifestyle around his passion for sculpting steel. Klabunde has been creating steel sculptures for decades, decorating terraces and courtyards of not only Santa Fe, but for collectors nationwide. Klabunde's work has been featured with the University of New Mexico, the College of Santa Fe, as well as the New Mexico Academy of Math and Science. His work is also featured in the book abstract art, a New Mexico Artist Series publication. Klabunde's work is primarily abstract and inspired by organic notations of nature. "…to release the soul of the Earth", is how he describes his work. By transforming metals that were once flat and without motion into dancing art forms that decorate our lives.